This is simplicity itself and great for starting out. You’ll need a large heavy-bottomed saucepan, a wooden spoon and some jam jars with lids. You can use loads of different fruits, but the best I find are blackberries and apples. If you use fruits with stones or hard seeds (damsons, rosehips, etc) you’d be best to sieve the jam before adding sugar, but otherwise it’s fine. Quantities are variable, but usually relate to how much you collect. For this, I’m using blackberries and apples – apples are great as they contain pectin which is a setting agent and helps the jam to set well. 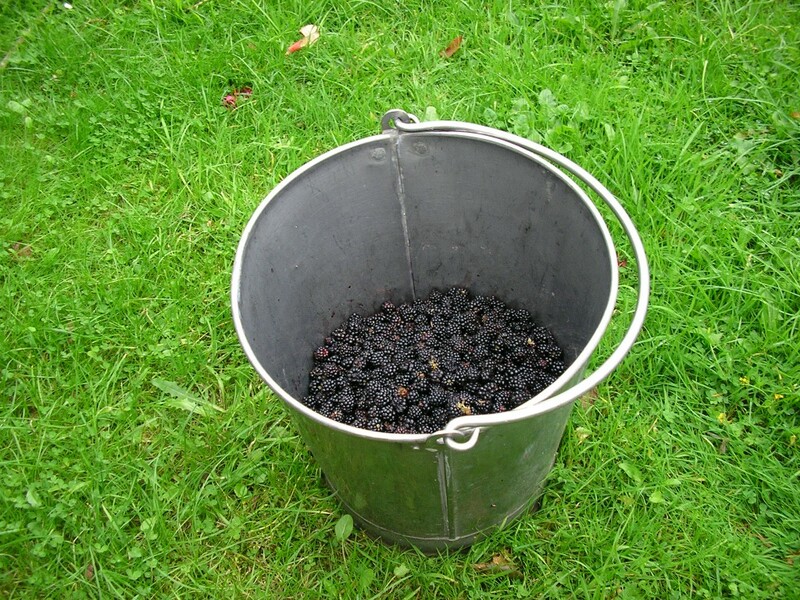 Take 1lb (450g) of blackberries, making sure there are no stalks, leaves etc. Add 1lb of prepared apples, peeled, cored and chopped into small chunks (sugar-cube sized) – you can use cooking or crab apples, as long as they are quite tart. Put in the pan with about 1 pint or ½ litre of water and bring to the boil. Boil (not too vigorously) until the apples are pulpy and the blackberries are soft and squishy. Then add 2lbs (900g) sugar and stir this in and let it fully dissolve – watch it doesn’t stick and burn at the base of the pan. Bring back to the boil and boil vigorously for at least 5 minutes. Then you have to test it for setting – put a small dollop (size of a 1p) on a cold plate, wait about 30 seconds and then push your finger through it – if the surface wrinkles and the jam isn’t really runny, it’s ready, otherwise boil again for a few minutes and try again. Prepare your jam pots – make sure they and the lids are really clean, and sterilize and heat the jars either with hot water and sterilizing liquid, or else in a low oven. Pour the jam into the jars – they need to be warm enough that you can just about handle them – and put the lids on. You should label them then, so that you can remember what it is! Use when it cools and it should keep for upwards of a year as long as it isn’t opened.